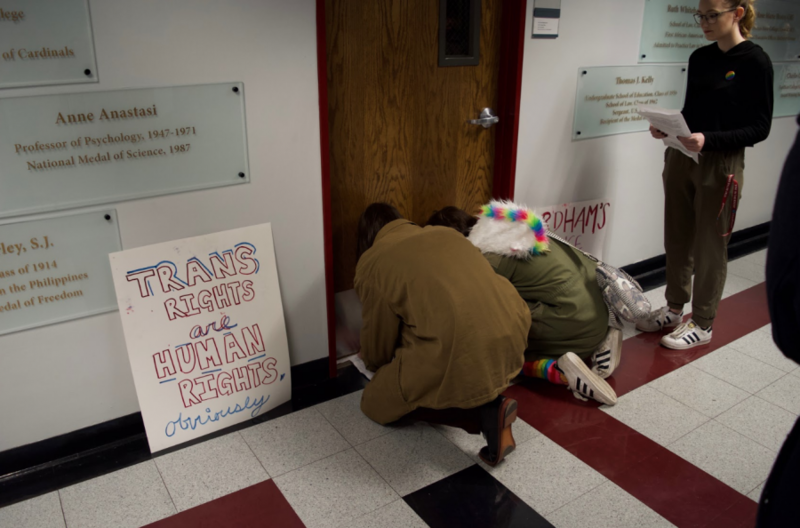 On Wednesday, Nov. 28, Senior Vice President of Student Affairs Jeffrey Gray sent an email to a short list of club leaders and faculty concerning the rights of transgender, gender non-conforming and intersex (TGNCI) individuals on campus. Gray informed the email’s recipients that discussions surrounding the process of more fully including TGNCI individuals in the university setting would “take more time and discussion” and asked for the university community’s patience. Gray’s response breaks 34 days of administrative near-silence since Rainbow Alliance penned an open letter to University President Rev. Joseph M. McShane, S.J., concerning the attacks on TGNCI rights in the United States. Eighteen days after the letter was sent, Rainbow Alliance, along with the Positive Coalition, SAGES, the Coalition for Concerned Students, PRIDE Alliance and the Coalition Against Relationship and Sexual Violence sent another email requesting a statement on TGNCI rights. Additionally, it brought attention to the fact that a flyer for the Rally for Trans Rights had been defaced 11 days earlier, with no reply from Public Safety or administration. In his email, Gray noted that he had sent a response to the authors of the open letter within 24 hours of receiving it in which he confirmed its receipt and promised to review the letter and its “related requests,” as well as follow up with the students involved. While Norman appreciated Gray’s response as a “reassurance of [TGNCI students’] safety,” they also expressed concern over the fact that larger university bodies still have not addressed threats against the TGNCI community. Norman also expressed concern over the email’s recipient list, as it included only students involved with the clubs who penned the open letter, department chairs and a handful of university administrators and staff. “I wonder what he is saying to admin who were excluded from his email response and members of the board of trustees,” they said.